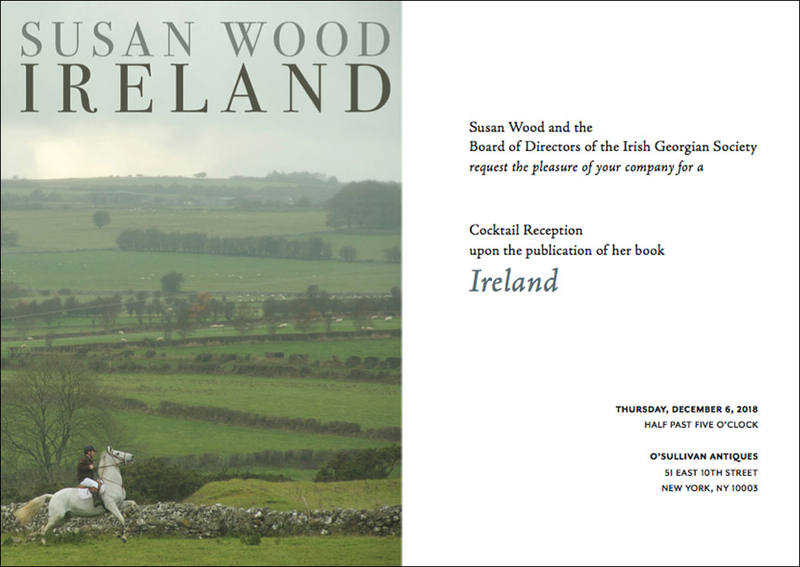 Cocktail Reception Upon The Publication of "Ireland"
Susan Wood and the Board of Directors of the Irish Georgian Society request the pleasure of your company for a Cocktail Reception upon the publication of her book “Ireland”, Thursday, December 6th, 2018. half past five o’clock. O’Sullivan antiques, 51 East 10th Street New York, NY 10003. Tickets are $50 and all proceeds will go to The Irish Georgian Society. For additional information, please contact Michael Kerrigan, Executive Director at 312-961-3860 or e-mail info@irishgeorgiansociety.com.